With Nintendo Switch Online launching in 2018, and for the very reasonable price of $29.95 AUD, the Nintendo Switch is on track to continue growing as a great gaming platform. But, as highlighted when the console was announced, there won't be native voice chat on the console itself. How will it work? Well, that's where peripheral maker Hori has stepped in. And this is based on the fact that all social stuff for the Switch will be handled by a separate smart device app. And in the world of gaming headsets designed for competitive titles like Splatoon 2, this results in a situation where the following happens. 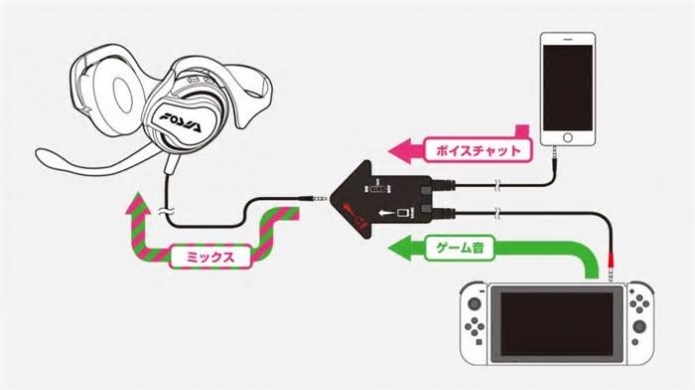 Yeah, so you'll need to connect both your phone and Nintendo Switch to a little hub thingy which then connects to the headset that will transmit both in-game audio and voice chat. Not exactly elegant, but it'll work. A shame because with all the tech contained within each Joy Con you'd thing that voice chat would be pretty easy to handle. Pretty sure it's going to be a single player console then. Am I missing something, this isn't an official peripheral is it? Looks to be a third party stepping in and creating a solution. Nintendo using an app to handle chat and match making, now that's wtf nintendo.